Gov. 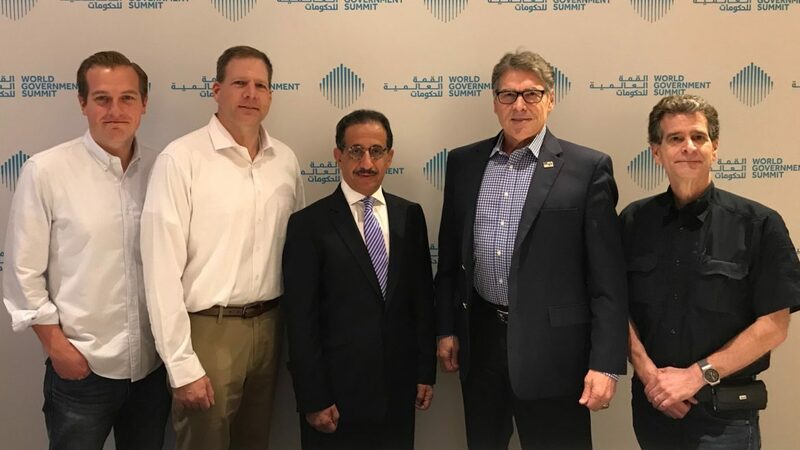 Chris Sununu stands with U.S. Energy Secretary Rick Perry, New Hampshire inventor Dean Kamen and Jamil Al Dandany, an executive at Saudi Aramco, a Saudi Arabia-based oil company in a photo taken during the World Government Summit in February and posted on the energy secretary's Twitter account. Sununu's $9,000 trip to Dubai was paid for by the summit. Gov. Chris Sununu’s five-day trip to Dubai in February cost an estimated $9,000, according to a document filed with the Secretary of State’s Office on April 1. The governor’s trip was paid by a representative of the World Government Summit in the United Arab Emirates, records show. Elected officials are required under state law to file a reimbursement report the last day of the following month after the event took place. The governor’s legal counsel, John Formella, said state law allows for documents such as reimbursement reports to be filed the next business day – if the last day of the month falls on a weekend or holiday. In February, the office of the governor released a short summary of the five-day trip to Dubai where the governor hobnobbed with Middle Eastern royalty, billionaires, oil company executives and U.S. Secretary of Energy Rick Perry. The governor attached a 38-page World Government Summit agenda to his April 1 filing, as required, but information on two events he highlighted in the summary wasn’t listed on the agenda: a dinner with attendees of an event he called the CEO Summit: Gathering of Game Changers and an all-day retreat at the desert camp of Dubai’s crown prince, Sheikh Hamdan Bin Mohammed Al Maktoum. Attempts to follow up about details of the trip with the governor’s spokesman, Ben Vihstadt, by email in February and by phone and email on April 1 were unsuccessful. Information on what was included in the $9,000 is unknown. The summary mentions that Sununu led a discussion at the summit “on education and positive impact of lifelong learning” and other breakout sessions, though his name isn’t listed as a speaker or the leader of a breakout session on the World Government Summit website. The governor did get to stand alongside New Hampshire inventor Dean Kamen on a stage as Perry announced that Dubai would host the FIRST Global Challenge, an international youth robotics competition, in October. FIRST Robotics was founded by Kamen to give students engineering experience by building their own robots and facing off in different games. Sununu said he was invited to the World Government Summit by Kamen, according to a press release issued before the event. 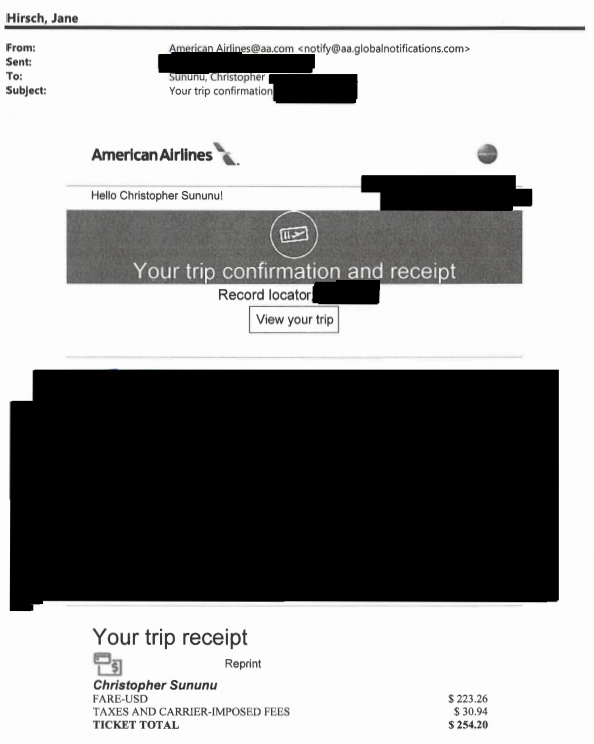 Example of redactions of travel receipts the state reimbursed Gov. Sununu for. To get more information about the governor’s travels, InDepthNH.org requested receipts and reimbursements filed by the governor since he took office in January 2017. Formella provided heavily redacted receipts for flights costing $254.20, $389, $560.30, $494.40, $514.64 and $1,020.12, an amount which included another passenger along with Sununu. Formella said a family member traveled with him on the trip. None of the receipts included dates or locations, as Formella cited “executive privilege.” A $93.25 receipt for a hotel was also included. The receipts provided by Formella do not match amounts posted on the state’s website, nh.gov/transparentnh/, which details expenditures and revenues. Since 2017, Sununu has been reimbursed by the state $5,923.10. The money was for in-state and out-of-state travel, including hotels, according to the website. The governor has also received $19,715 from his inaugural fund, the Sununu Inaugural Celebration, for travel expenses. It’s part of about $39,100 the governor has received in reimbursements from his inaugural fund since its formation.